*Qualified Master of Science in Nursing (MSN) applicants who apply by July 31st, 2018 are eligible for our $2,500 *Early Application Award! 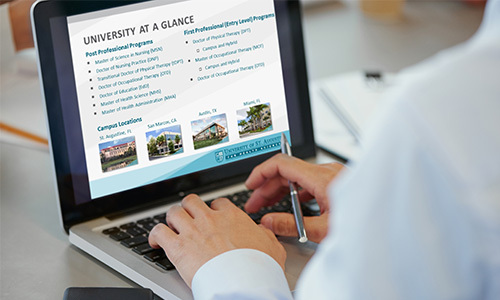 Complete the form below to register for this or future virtual information sessions and get a jump start on your application for admissions to the USAHS Master of Science in Nursing (MSN) program! * This offer is only valid for eligible new students who enroll by July 31, 2018 and start classes in the Fall 2018 term. This offer is not a guarantee that all candidates eligible for the offer will be granted acceptance or admission into USAHS. All prospective students will be subject to the same standard admission and registration process when applying to USAHS. The tuition reduction is applicable to tuition only and does not apply toward books, materials, and other supplies or fees. The tuition reduction cannot be used in combination with any other tuition benefit other than the tuition award specified.